Steam locomotives were the first self-propelled vehicle that could travel at any sort of a sustained speed*. The first trains seldom traveled more than 15 miles an hour, but average speeds increased in keeping with technological improvements in building locomotives and more stable railroad tracks. Owing to their larger size and faster rate of travel, trains had far more destructive potential than any previous method of travel. 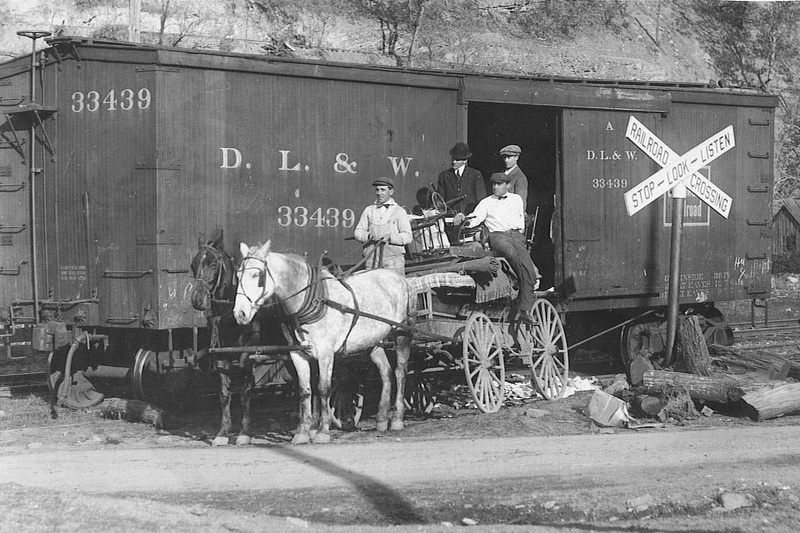 When the railroad was in its infancy, though, collisions between trains and pedestrians or livestock were rare. It was far more common for trains to be involved with collisions with other trains, because the development of dependable signal systems lagged several decades behind the invention of locomotives. The railroad system in the United States, the United Kingdom, and the rest of the world developed at a feverish pace once its ability to turn a profit became clear. The web of tracks expanded to connect a constellation of towns into one tight network, and made settlements in far-flung locations feasible. The tracks often went right through the heart of town, in order to give the railroad access the local industries, and bisected previously existing roads and footpaths. A higher and higher percentage of the population came in close contact with the railroads. Inevitably, injuries and fatalities resulted, and steadily climbed as the railroads continued to increase their reach. 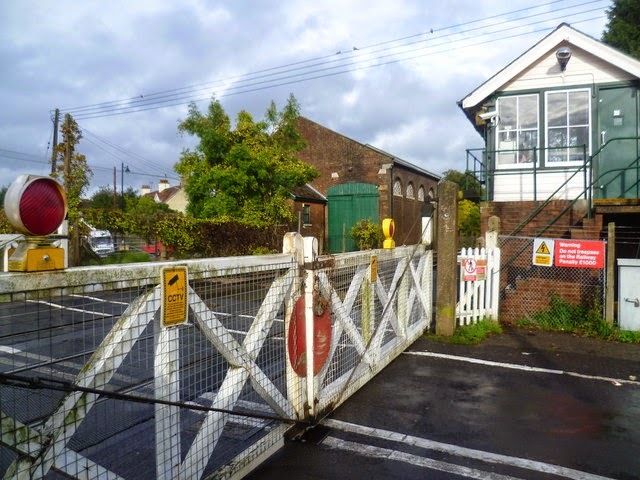 Railroad gate in the UK, still used in modern times. In an attempt to lessen the risk of the public wandering into the path of oncoming trains, railroad companies in the United States and the United Kingdom began to install wooden gates at the busiest intersections of roads and railroad tracks. These could be moved in order to block off either the railroad tracks or the road, depending on which was currently in use. The first American patent for such a device was given in August 1867, and in the United Kingdom, railroad companies attempted to place signal houses as close as possible to frequently trafficked crossings so the staff could confirm that no road traffic was present before allowing trains forward. In both countries, a substantial number of women were employed to staff the crossings--a rare source of steady, outside the home employment. By the mid 19th century, the railroads in the United Kingdom had matured, and track construction and traffic in the United States swelled after the Civil War. Almost half a century of unbridled growth had made many railroad companies exceedingly profitable and vested with significant political power. This, especially in the United States, made them the subject of public scrutiny. The railroads’ former excuse--that individuals who were injured or killed had failed to remain clear of the tracks and were thus at fault--had begun to wear thin. The United States Supreme Court took up the issue of who, exactly, was responsible for safety at grade crossings in an 1877 case titled Continental Improvement Company v. Stead. The majority opinion stated that the division was “mutual and reciprocal.” In other words, while the public did have a duty to be aware of their surroundings, the railroads also bore a responsibility to provide fair warning when trains were approaching. Crossing sign, dating to about 1900. In response to this ruling, and to the increasing number of accidents, the railroad companies made a more proactive attempt to clearly mark all intersections of roads and railroad tracks, instead of just the busiest crossings. The first signs that they installed were usually posted at a height of 9 feet, so as to be visible to people riding on horseback, and varied in shape and wording. Eventually, the standard became a crossbuck, or saltire in more formal heraldic terms, with black lettering. As time progressed, these signs began to incorporate whatever reflective materials were available at the time. The United Kingdom continued to use gates as a primary traffic barrier. In some places, they were used well into the 20th century. Railroad companies in the United States transitioned instead a single iron bar, painted in the crosshatched pattern familiar in the present day. This could be lowered or raised in seconds, and did not require the crossing attendant to leave the shack when a train was on the way. Since they were significantly heavier than wooden gates, most of the women who had previously manned crossings were no longer physically capable of carrying out their duties. The way in which train crews signaled to each other, and to warn the public, were also standardized during the late 19th century. Prior to the invention of portable radios, the primary use of whistle signals had been to coordinate crew activities and train movements. With increased scrutiny placed on their role in accidents, train engineers were instructed to ring their bells and whistle at all crossings in order to alert the public to their presence. 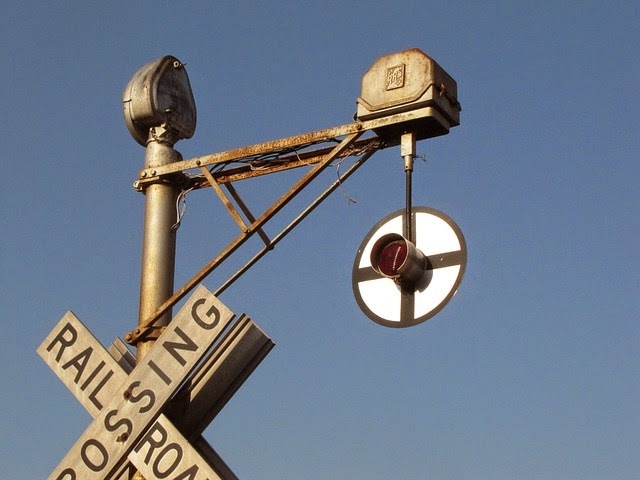 The familiar “--O-” signal, used by all American railroad companies, originates from around this time. This crossing sing is little different than any other street sign. 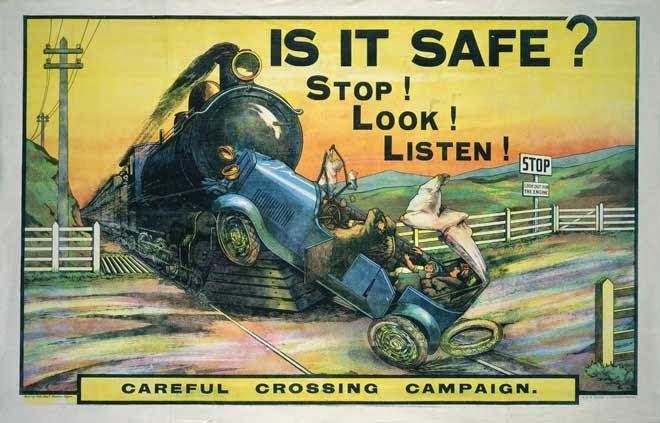 Shortly after the turn of the twentieth century, as automobiles became a common source of personal transportation, fatalities at railroad crossings dramatically increased. Drivers sitting inside of a car have a smaller field of vision than someone on foot or horseback, and are insulated from a train’s whistle and the sounds from other warning devices. In addition, the fact that even early cars carried combustible fuel and were larger and more solidly built than horse drawn wagons presented more of a risk to the crew inside of the locomotive. bells at railroad crossings. It was no longer necessary to depend on a person to give forewarning of a train on the way, and feasible to protect less frequented railroad crossings. 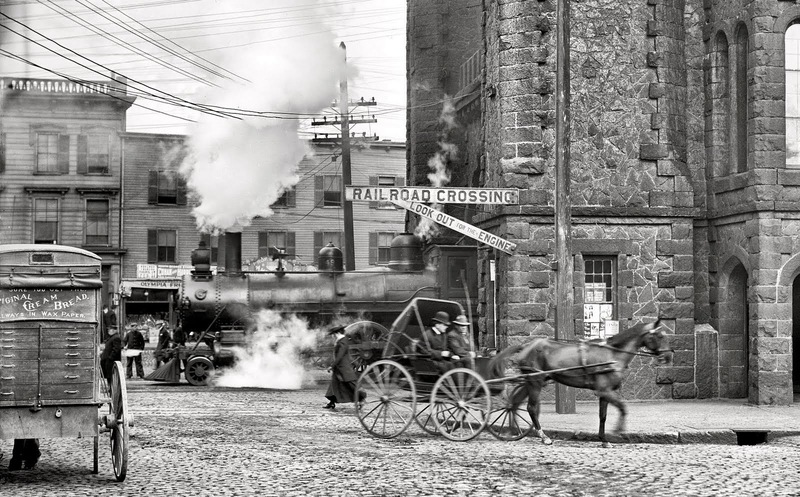 By 1920, there were approximately 10 million cars on the roads in the United States, and 250,000 railroad crossings. Train and vehicle collisions increased both in frequency, and in the likelihood of a fatality resulting: In this same year, more than 1000 people were killed and almost 4000 people were injured in preventable crossing accidents. Urging drivers to be cautious around railroad tracks no doubt prevented some collisions, but was not as effective as a physical barrier. In the 1950s, researchers at the Stanford Research Institute working at the Southern Pacific’s request, developed the technology for fully mechanized grade crossing gates. The activators developed during this decade were an improvement over the activators used with wigwag signals, which could not determine the speed of an approaching train and sometimes gave inappropriately long or short warning times. These newer versions contained small computers which calculated the proper time to activate in order to give drivers and pedestrians in the area approximately thirty seconds of warning before the gates lowered. Over time, this technology spread out to most other countries in the world. The sentinels at the railroad crossings have, more or less, appeared in this same form since the 1960s. The technological developments since then have been minor and mostly invisible, such as improving the sensors and wiring some crossing gates to solar panels. The one significant change is the FRA’s increased allowance of quiet zones, where train engineers are forbidden to use the whistles except in cases of imminent danger. The gates at these crossings are designed to completely block the crossing and interlock when lowered. Quiet zones are usually granted after a petition from members of the public who have tired of the noise from train horns, but by some estimates, have a higher danger rate. In the spirit of preventing casualties, we'll end this article with a public service announcement. Despite the tireless work of Operation Lifesaver and other advocacy groups there are still several thousand collisions and hundreds of deaths at grade crossings every year. Every single one of these incidents is preventable, and each of them leaves a traumatic impact on the members of the train crew involved. Don't be the guy that proves we still need these safety measures. *Steam boats preceded the invention of steam locomotives, but, provided that both are operated properly, they will never cross paths.